You are here: Home / Ethnic Groups / The People of Java / Who are the West Coast Javanese? Who are the West Coast Javanese? 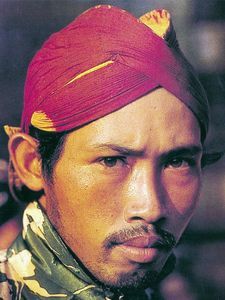 The West Coast Java people group is also called the Jawa Cirebonan or the Cerbon people. Their center is in the regencies of Cirebon and Indramayu in the West Java province. They live in small cities like Patrol, Anjatan, and Haurgeulis. Some Cirebonan villages are also located in the province of Central Java. Ceremai Mountain marks the southern border of their area while the Java Sea coastline marks the northern border. Geographically speaking, the West Coast Javanese people group live in Sundanese districts. But they use the Jawa Ngoko Cerbon (Jawa Cerbon) language. This language is a mixture of the Javanese, Sundanese, Arab, and Melayu languages. The Cerbon Ngoko language is taught to every Cerbon child from first through tenth grades. The West Coast Java people tend to be open and spontaneous in their social interactions. This is visible in their vibrant, colorful, and artistic clothing. Their culture leans more toward Islamic culture than toward their own historical Javanese culture. Islam is looked at as the national cultural foundation. It takes precedence over the traditional Javanese cultural values that are still predominant in Central and East Java. The word cirebon is a combination of two words, ci which means water and rebon which means shrimp. Cirebon has always been famous for its salted fish and fresh shrimp, as well as shrimp paste used as a spice. Most West Coast Java are fishermen or farmers. Their land is very fertile and has acres of plantations that produce and export crops including coffee, sugar, and the well-known Dermayu mango. There is also a local government owned oil refinery. Many of them work in government and private institutions. Craftsmen make various products from the world-famous batik cloth, as well as clay, wood and rattan. The city of Cirebon is also considered a tourist destination because of the many historical and sacred landmarks. Cirebon, the main city of the West Coast Java, served as a base to spread Islam by Sunan Gunung Jati (1448-1580), who was one of the Wali Songo (Nine Apostles of Islam in Indonesia). Therefore, Muslim pride in this area is quite strong. The large majority of the West Coast Java people are Sunni Muslims. Despite this, the practice of occultism is very evident. Dukun (shaman) are still relied upon heavily. Various ceremonies including ritual meals are done to obtain happiness, safety, and peace. The economic development of the ‘Cerbon’ region is indeed promising with every reason to believe in an upward spiral of productivity. The question is: who will profit from the material gains being made? The living standard of the masses remains fixed at about $50.00 per month. They need practical vocational training and teaching, including appropriate technology. Present industries need to be expanded, and the transportation infrastructure must be developed to better enhance the marketing of their products.